The religious sanctuaries of ancient Italy were busy and multi-faceted places, playing roles not only in religion and ritual, but also in commerce and connectivity. People visited sanctuaries to participate in ritual, connect with their community, and to commune with the gods. The religions of ancient Italy relied heavily on votive practices—that is the giving of gifts or offerings to the divinities that helped to affirm a pact or agreement between the worshipper and a god or goddess. Votives could be humble objects from everyday life, or they could be purpose-made prestige objects. In all cases, votives are particularly instructive in informing us about ritual practice in the ancient world. The so-called Mars of Todi is an inscribed Etruscan bronze statue dating to the late fifth or early fourth century B.C.E. It was discovered in 1835 on the slopes of Mount Santo near Todi, Italy (ancient Tuder). The hollow-cast bronze statue is the product of an Etruscan workshop but was likely produced for the market in Umbria (a region in central Italy). The statue measures 141 cm in height, making it nearly life-sized. 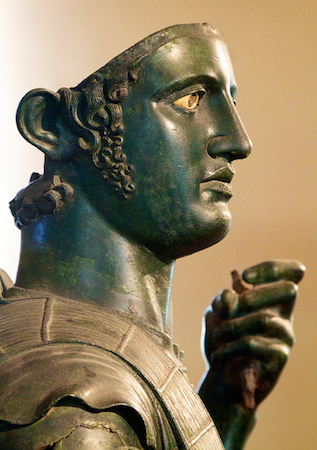 The Etruscans were adept metalworkers and Orvieto (Etruscan Velzna, Roman Volsinii) was particularly known for the production of bronze statues. 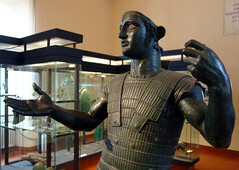 The Romans reportedly removed 2,000 bronzes from Volsinii when they captured it in 265 B.C.E. (Pliny, Natural History 34.33). It is possible that the Mars of Todi was originally produced there. The warrior is clearly a prestige object, a worthy votive dedication. It is likely that the object was dedicated to Laran, the Etruscan god of war. Dressed in intricately worked plate armor, the figure takes a contrapposto stance and indicates that the Etruscan artist was aware of the formal elements of the Classical style of sculpture. These classicizing elements indicates that the artists of Etruria are not only aware of Mediterranean stylistic conventions but also that they are comfortable enough with these stylistic trends that they can in turn adapt and apply them to local tastes and demand. Likely attached elements—including a patera (a libation bowl) held in the right hand and a spear in the left—have not survived, nor has the helmet that he wore atop his head. The bronze statue bears an inscription in the Umbrian language that has been written using Etruscan characters. 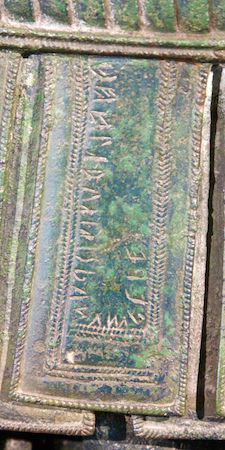 This dedication is inscribed on the skirt that is attached to the breastplate and reads “Ahal Trutitis dunum dede” (“Ahal Trutitis gave [this as a] gift”). The dedicant—Ahal Trutitis—has a name that is Celtic in origin, which lends this dedication of an Etruscan object in an Umbrian sanctuary a particularly cosmopolitan element. The Mars of Todi is a rare object in that many prestige votives of its stature have not survived from antiquity. The careful burial of this object—perhaps after it had been struck by lightning*—accounts for its survival. The composition represents the tradition of libations made by soldiers prior to battle, an opportunity for beseeching the gods for support and success in battle. The dedication of this object is also indicative of the dynamic human landscape of ancient Italy—within that human landscape sanctuaries often served as nodal points where diverse cultures came into contact with one another. This votive statue, then, tells us a great deal not only about ritual practice and iconography, but also about those who frequented sanctuaries in ancient Italy. In ancient Italic religion lightning was sacred, as it was connected to the chief sky god, called Iuppiter (Jupiter) by the Romans and Tinia by the Etruscans. Thus on occasions when lightning struck the Earth, the spot which—or the object which—the lightning “selected” (fulgur conditum) would become even more sacred. Roman ritual doctrine considered these consecrated spots special and thus they were often marked in some way. The Puteal Libonis (also known as Puteal Scribonianum) in the Comitium of the Forum Romanum provides such an example; after a spot in the Comitium had been struck by lightning, it was marked with a puteal (a marble wellhead) (Festus 333). The Romans considered these special shrines, which often had a circular templum (a sacred, inaugurated precinct), as bidentalia (from the Latin noun bidental, bidentalis “a place struck by lightning”) and it was forbidden to tread on them. In the case of the Mars of Todi, the statue was found carefully buried in a stone-lined cist, leading to the conclusion that the statue had been struck by lightning, which caused it to fall from its podium and that it was subsequently ritually buried. The ritual burial of votive objects is a common practice in ancient Mediterranean religions, but the treatment of these bidentalia was special in its own right. G. Bonfante and L. Bonfante, The Etruscan Language: An Introduction, revised edition (Manchester: Manchester University Press, 2002), p. 26. G. J. Bradley, Ancient Umbria: State, Culture, and Identity in Central Italy from the Iron Age to the Augustan Era: State, Culture, and Identity in Central Italy from the Iron Age to the Augustan Era (Oxford: Oxford University Press, 2000). p. 92. O. J. Brendel, Etruscan Art, 2nd ed. (New Haven: Yale University Press, 1995) p. 317. D. Strong and J.M.C. Toynbee, Roman Art (New Haven: Yale University Press, 1976, 1988), pp. 32–33. F. Roncalli, Il Marte di Todi: bronzistica etrusca ed ispirazione classica (Rome: Tip. poliglotta Vaticana, 1973). E. Simon, “Gods in Harmony: The Etruscan Pantheon,” in The Religion of the Etruscans, ed. by N. T. De Grummond and E. Simon, pp. 45-65 (Austin: University of Texas Press, 2006). J. M. Turfa, Divining the Etruscan World: the Brontoscopic Calendar and Religious Practice (Cambridge: Cambridge University Press, 2012). Cite this page as: Dr. Jeffrey A. Becker, "Mars of Todi," in Smarthistory, August 8, 2015, accessed April 19, 2019, https://smarthistory.org/mars-of-todi/.